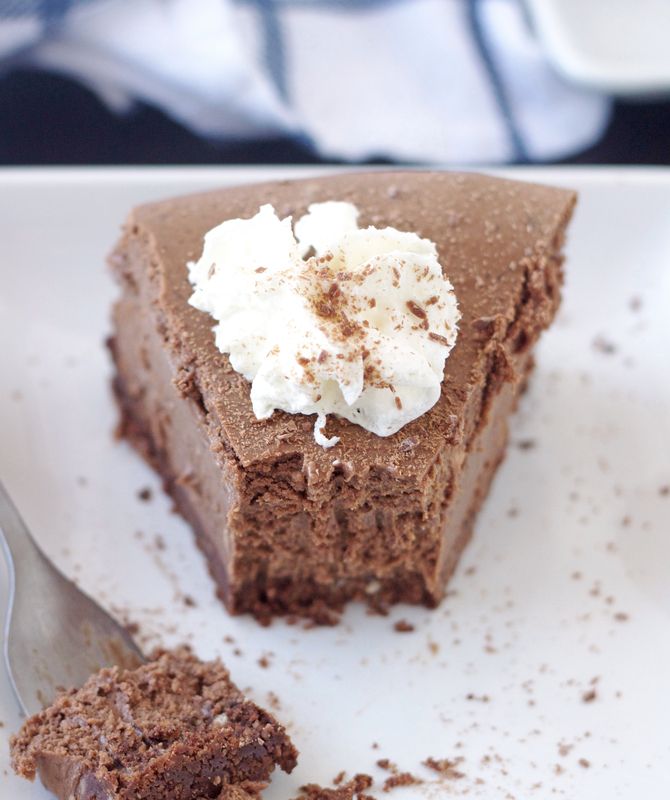 This Fudge Truffle Cheesecake is rich, decadent and thoroughly divine. It will definitely WOW your guests. 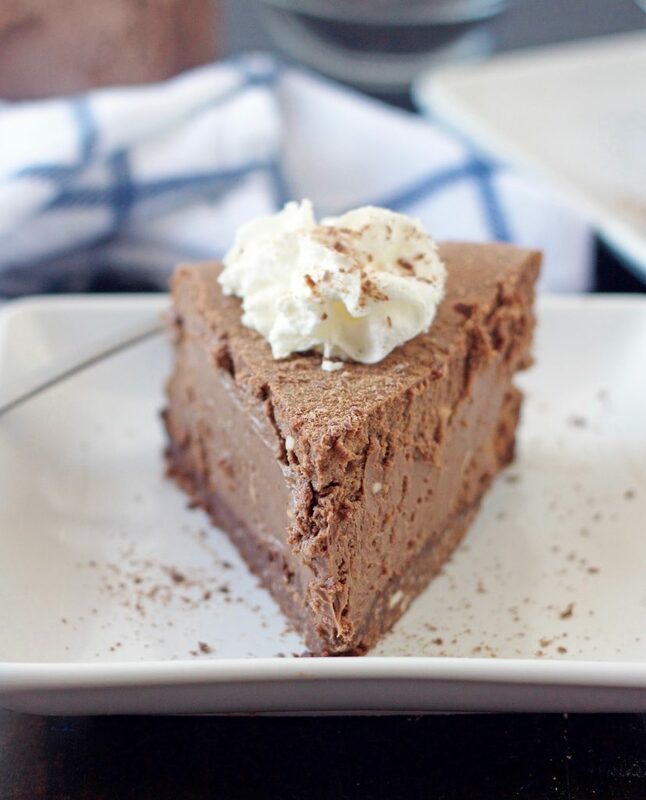 A chocolate coma definitely awaits you with this cheesecake. It’s rich, dense and a chocolate lover’s dream come true. 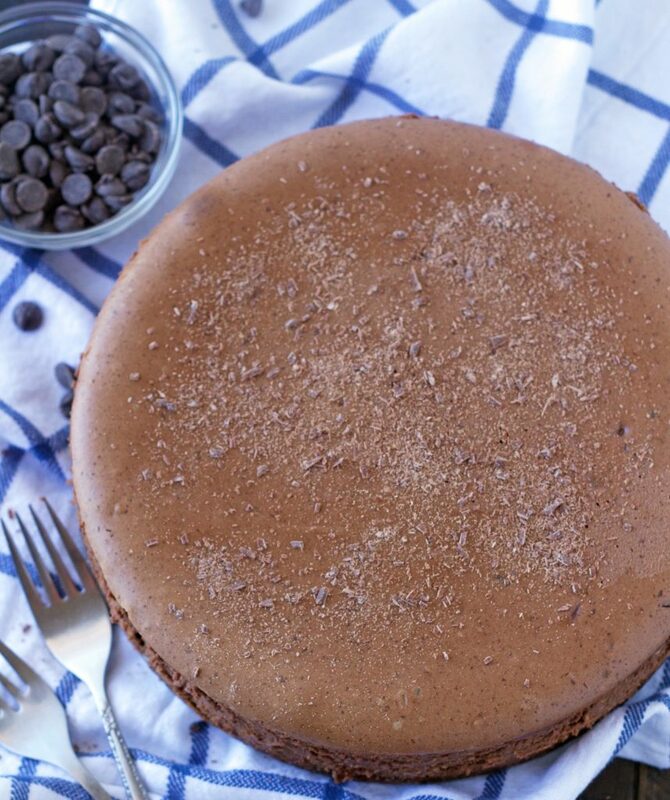 This beauty starts with a chocolate vanilla wafer crust and then the cheesecake filling . . .oh my! Melted chocolate chips and sweetened condensed are the stars of the show here. I don’t know about you, but the words cheesecake and sweetened condensed milk together are music to my ears. I thought about drizzling chocolate on top and doing a bunch of fancy schmancy whip cream dollops, but I’m really glad I didn’t because this cheesecake is so rich, that it doesn’t need anything on top. I did have to do a little dollop of cream for pics, I mean it’s got to look pretty, right? This is a really simple cheesecake to make and will definitely be the hit of any party. In a medium bowl stir together the vanilla wafer crumbs, powdered sugar, cocoa and melted butter. Press firmly onto the bottom of a lightly buttered 9-inch springform pan. Set aside. Place chocolate chips in microwave-safe bowl. Microwave at 50% power for 1 1/2 minutes; stir. If necessary, microwave at MEDIUM an additional 15 seconds at a time, stirring after each heating, just until chips are melted when stirred. Using a hand or electric mixer, beat cream cheese in large bowl until fluffy on medium speed. Add sweetened condensed milk and mix until smooth. Add melted chocolate chips, eggs and vanilla; mix well. Pour into prepared crust. Place springform pan on a cookie sheet and place in oven. Bake at 325 degrees for 60 to 70 minutes or until the very center is almost set. Remove from oven and place on a wire rack. With a knife, carefully loosen cake from side of pan. Cool completely; remove side of pan. Refrigerate several hours before serving. Garnish as desired. Cover; refrigerate leftover cheesecake. Oh it is Michelle! I hope you have a chance to make it. Sooooo creamy and delicious! I decorated the top with a very light layer of sweetened whipping cream and raspberries. Divine! And easy! Holy moly this looks awesome! Do you need to spray the pan first? Thanks so much! Hi Tammy! Yes, I lightly butter the bottom of my springform pan. I just added that in the instructions. Thanks for checking.